The light commercial vehicle, or delivery van, is the workhorse of both companies and the self-employed in the economy. And with good reason: it is a multifunctional and flexible mode of transport and compared to (smaller) trucks and cars it is also cheap to buy and use. Moreover, a ‘lighter’ drivers license B is sufficient to drive a light commercial vehicle (LCV). Light goods vehicles (LGVs) or vans are defined as commercial vehicles of no more than 3.5 tonnes and HGVs as commercial vehicles more than 3.5 tonnes. About 80 percent of city logistics is done with LCV’s and cities around have seen major growth in light goods vehicles in recent years. LGVs were the last to transition to the Euro 6 standard. The impact of LGVs on air pollution and congestion in cities is significant. In total 35% to 50% of all vans are used for goods logistics. Over half of all vans are deployed in the construction and trade sectors, although a large proportion of these do not fall within the area of goods logistics, but are used for servicing work that involves carrying tools, for example. The remaining use of vans is mainly service-related (27% to 40%) or relates to deployment for passenger transport or private use (about 24%). LGVs will move from the use of fossil fuel to clean tech; zero emission LGVs will be the standard for many cities in 2030 (starting with ultra-low emissions zones in 2020-2025). New services will develop moving away from ownership, to sharing. Logistics as a service (based on the best ‘cost to serve’ options) will be offered by major OEMs, fleet companies and Uber-platforms. Public-private partnerships will support smart, and even fast, charging facilities near office buildings, shopping streets, construction sites, and industrial zones. The van is an integrated part of physical internet concepts. The delivery van is only one element of the last mile supply chain starting at distribution and sorting centers (and coming back). Containerization will be leading many innovations to improve speed in the supply chain and reduce the cost of handling. 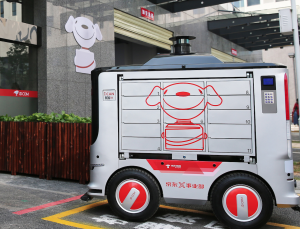 These capabilities support new ways of ‘final 50 feet’ deliveries with cargo bikes, drones, micro delivery robots, automated lockers or even people walking. Planning of LGV networks will move from push to pull. The customers in B2C and B2B will be in control of the final mile; buy, receive and return, anywhere and anytime. They want it all, they want it now. The tactical and operational planning will be supported by real-time and predictive open data on e.g. traffic, parking, charging and customers’ locations. Onboard ICT will be open platforms with many different apps to support the driver will be supported with real time, and even predictive, situational awareness. The vehicle will be connected; Internet Of Things/5G will offer new capabilities for management of car stock, road safety, autonomous driving (‘follow me’), talking traffic lights, allocating loading and unloading zones and local traffic control by authorities. Cybersecurity will be a major risk but is also an opportunity in providing new tools to cope with fraudulent customers. Future transport planning systems will be based on distributed, decentral planning, rather than central planning offering dynamic rerouting and rescheduling. Together with up-to-date traffic information, good planning can be made for the reliable use of the electric vehicle. Information to the customer about the estimated time of arrival (ETA) will be based on real-time info (ITS). Last mile planning will move from being blind to being clairvoyant. Driver behavior monitoring is key. The driving style and route choice determine the range of an LGV, damages and road safety. Electric vehicles have onboard computers that monitor and support vehicle performance, the status of the journey, the battery and the driving style of the driver. Last, but not least, the delivery van of the future might not be a van anymore. City logistics will focus on safe and light electric vehicles, cargo bikes and even engineers walking.